Our Flower Power Soap has a gorgeous fresh lemony scent which is especially popular with our teenage customers. Therapeutic grade essential oils of Lemongrass, Geranium and Bergamot are combined to give this soap amazing uplifting qualities. These essential oils are also known for their antibacterial, antiseptic and balancing properties. 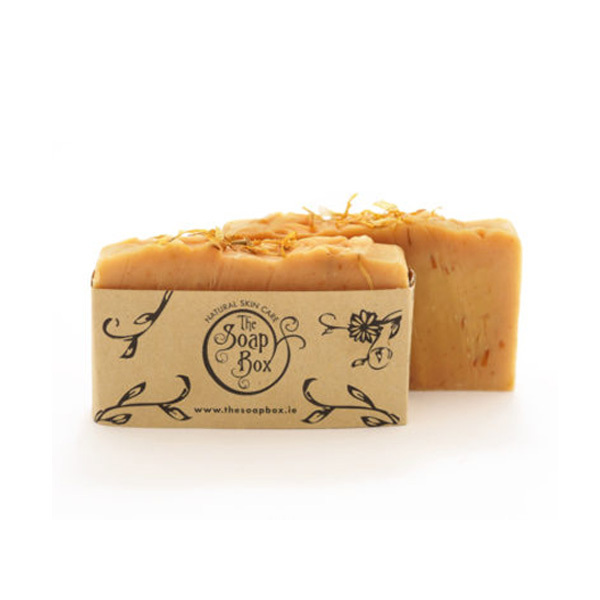 Our unique soap contains calendula petals which gently exfoliates and sooths the skin. This soap is highly recommended by our customers for acne and problem teenage skin. Your skin is in for a treat with the Soapbox’s handmade cold processed Flower Power Soap. This method of soapmaking ensures that the soap retains it’s natural glycerine which is great for the skin. A blend of olive, coconut and castor oil is used which results in a glycerine rich bar with a rich luscious long lasting lather. Beeswax is added for hardness. The scents in this range are from a blend of high quality pure essential oils, each with their own therapeutic properties. Each variety has it’s own natural exfoliant in the form of flower buds and seeds, citrus rind, wholegrains and seaweeds. The colour is obtained from plant roots and seeds. Talk about spoiling your skin! We hope you enjoy using our soaps as much as we enjoy making them. This is a range of 100% natural cold process soaps. This method of soapmaking ensures that the soap retains it’s natural glycerine which is excellent for the skin. A blend of food grade olive oil, coconut oil and caster oil is used which results in a glycerine rich bar with a rich luscious long lasting lather. Beewax is added for hardness. The scents in this range are from a blend of pure grade essential oils, each with its own therapeutic properties. Each variety of soap has its own natural exfolient in the form of flower buds and seeds, citrus rind, wholegrains and seaweeds. The colours are made from plant roots and seeds. All Natural Ireland products are handmade in small batches, to ensure the finest quality. Hand made products are of the highest quality as they are not mass produced but hand crafted in a carefully controlled process. All Handmade Soap products are made from food grade oilive oil and a blend of high quality natural oils and butters.